Sling Media, the creators of a hardware device that lets users stream their home television signal to an Internet connected device anywhere (with a software download), is preparing to launch their new video portal, Sling.com. The company first mentioned the new portal earlier this year but has been quiet since then. 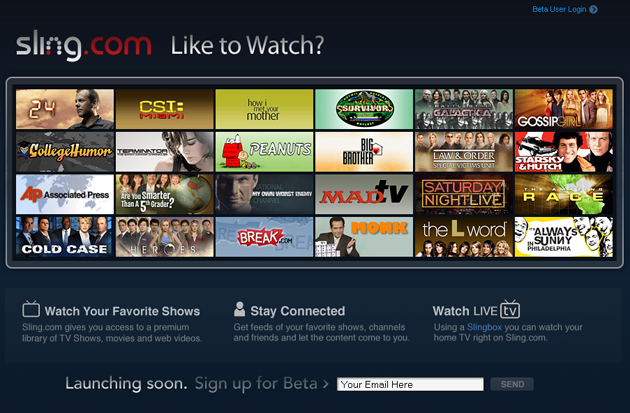 Sling Media is getting ready to roll out a private beta program for our new website, Sling.com. And you’re invited! We really need your help banging on the site and providing feedback so we can improve some rough spots before we push a release to a broader audience. – First, go to https://betasecure.sling.com/account/login and click “REQUEST AN INVITE” on the right. – Over the course of the next couple of days and weeks we’ll be sending out batches of invites to our beta team. – When you get your invite, follow the link provided and you’ll be prompted to either create an account or update your existing Sling Account. Then you’ll be off and running. – Please keep in mind, this is a US only test. Other users will be geo blocked unfortunately. Sling.com is a new online video portal that will give users access to a premier library of content from top TV networks, movie studios, sports leagues and websites. Combining professional programming, editorial expertise and social networking features alongside easy and logical navigation. In addition to premium on-demand video content from 60 partners (and counting), Sling.com includes a preview of the web-based Slingplayer software for PC, allowing Slingbox owners to watch live TV directly within our website. We need your feedback so we’ve made it very simple. You’ll notice a “feedback” button on the right-hand side of every page in the site. Click it and use the tool to submit your feedback from any page quickly and directly. Submit bugs, suggestions, usability issues, content problems, performance issues, etc. using the feedback tool and we’ll take it from there. Your feedback is critical and we look forward to hearing from you as we launch the first of many phases of Sling.com. Please treat your Sling.com account with the utmost confidentiality and do not share any information about Sling.com with anyone outside the beta program. The new service will let users grab snippets of television content, upload them to the Sling site (Hulu also lets users create quick content snippets), and create playlits and feeds that can be viewed and subscribed to others. According to the email above, Sling will also provide direct access to content from sixty current partners, and let SlingBox users access their TV directly from the browser. Suddenly Sling Media doesn’t look much like a hardware company, but rather a direct competitor to online video sites like YouTube, Hulu and Joost. If users can control their own television and DVR through the browser, and also access direct premium content, it’s a big competitive advantage over those other services. It may even get me to buy a SlingBox.